Some days, it’s so easy to smile. You wake up to your cab driver’s voice saying he will be late by another half an hour and you snuggle under your blanket for another five minutes. You get ready and find yourself greeted with a hot cup of coffee made by your husband or your roommate. You reach work beaming with joy, ready to take up the challenges. But, some times you wake up to chaos. Your alarm doesn’t ring and your cabbie doesn’t turn up. You wake your husband up only to find that he is again back in bed, snoring away to glory. You manage to reach work (but late) only to be bombarded with 700+ mails to reply to. Things fall apart, things fall short. You struggle to go through the day, some times wishing to stop the world for a second so that you can breathe. How do you cope up? Smiling happens without much thought. You walk with your friend by your side, hear “Thud! !”, only to find her face down on the ground, your very first reaction is to giggle. When you watch a colleague do something silly or embarrassing, you smirk. When a police officer lets you off without a ticket, you grin. And when you are appreciated by your client or recognized for your top performance at work or a get a promotion (which I did this week, by the way), you beam. Call a friend who knows how to laugh at herself. Listen to that perfectly made mix CD to unwind. Send him a sweet text message. Kiss. Hum a song. Paint your toe nails yellow or green or whichever that you wouldn’t usually pick. Go outside and smell the flowers. Give a Big Bear hug. Watch Popeye. Bake some fresh cookies. Wear perfume. Write a hand-written letter. Put on your favorite music and dance. Think happy thoughts. Give your cat a ball of yarn or give your dog a wrapped gift. Put on a dress and flaunt. Click pictures. Make a new friend. Talk to the person next to you on your cab. Carry out a Random Act of Kindness. We played a game last Friday at work where in one had to write things he likes and dislikes in a person. Of almost all the positive things which was written for me, one was common. It was that I am always seen with a happy smile. Isn’t it beautiful? Shed your inhibitions and worries. Smile…it costs nothing. 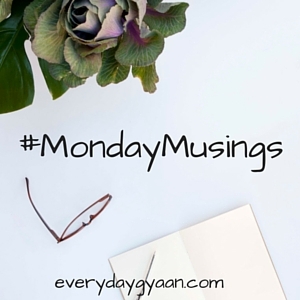 I am happy to co-host #MondayMusings at Everyday Gyaan with Corinne Rodrigues. A smile is contagious too, and goes from us to someone else, and from that someone else to another person. 🙂 It’s nice, and as you say, costs us nothing. And your smile is quite beautiful indeed. Smiling is a great start! For me…music soothes my soul, fires me up, and gives me reason to go on with life. A smile is hard to resist so thanks for reminding us about smiling more often. Smile. It’s such a simple thing, yet most people find it incredibly difficult to do. I mean the whole ‘natural’ one – not the forced smiles. Congrats on the promotion, by the way, Shalini. yes its true that smiles are infectious. unfortunately so are grimaces sometimes. I try and smile as much as possible but its not always easy. Thanks for the great words though. I love the little images. Congratulations for the promotion. It is a big reason to put up a beaming smile on the face. I have spent the last 3 days (extended weekend) driving acroos the city and today I just want to snuggle up in the blanket and sleep uniterrupted for the next 2 hours, atleast, but I have yoga class to attend in next 10 minutes. And here I am smiling, thanks to your post. A lovely reminder. It always does give positive vibes when you see a smiling face. Be positive and spread positiveness. Good mantra for Mondays.